Just yesterday, she came around with this toy – “iTel iNote Beyond 3G” and was like – hey boy, I’ve got myself a decent phone since you insisted on changing my windows mobile phone. I held the device for about 30 minutes accessing the features and can’t hide how much dissatisfied I was with the design and internal memory that leaves so much to be desired. Even though it is a common knowledge that one can increase the internal memory of android phones using this trick, it still doesn’t justify a smart phone coming aboard with only a meager 150MB of internal storage. Installing 6 good apps without tweaking the internal memory of the device was fully an effort in futility. Anyways, i got the device all setup and working just the way she wanted it to. Memory – The 8GB removable storage that came with it would have been a plus if not for the miserly 150MB internal storage. The RAM is 512MB, it performs fine knowing that you can’t really install many apps on it. The iTel iNote Beyond 3G Review won’t be exactly complete without listing some of the features, design and hardware specifications. 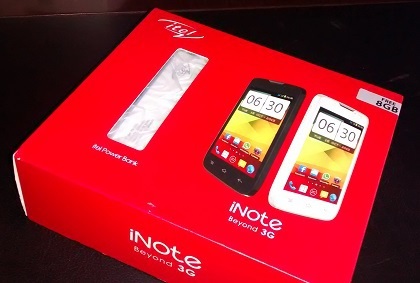 The price of Itel iNote Beyond 3G varies depending on the shop and place, she bought hers at a Benin for NGN13,500 which is about $70. I don’t see anyone wanting a device with such poor features, but if you really want to give it a shot, you can check for its availability in Jumia, Konga and other eCommerce stores that deals on gadgets and electronics.